While prenuptial agreements or ‘prenups’ are becoming more common nowadays, their earliest adopters were the couples who boasted significant wealth between them. Wealthy couples tend to plan more than those who have fewer assets, simply because ensuring both spouses receive a fair share while retaining specific, sentimentally valuable items can be quite complex. However, even the middle class are utilizing prenuptial agreements more often now, and many are doing so without a clear understanding of what they can and cannot do. Enlisting an attorney with experience in such matters can be critical. Perhaps the most common way that prenuptial agreements are used is to specifically delineate certain assets to be retained or divided in the event of a divorce, even though some of these assets may be normally classified as marital property. While some of these items will be classed as non-marital property regardless – for example, a wife’s jewelry handed down as a family heirloom will almost always be held to be non-marital – other items are more fungible, and thus may be established as either marital or non-marital. Essentially, a prenup helps to preserve certain fungible assets from becoming part of the marital estate, even if commingling occurs – for example, stock options you may have possessed before the marriage can be stipulated to remain nonmarital property, even if your spouse becomes involved in the stocks’ management or in any other aspect of properly exercising such options. It is, however, possible for nonmarital property to ‘convert’ into a marital asset over the years if certain actions are undertaken (or, in some cases, not undertaken). 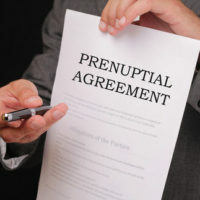 Even though it may seem that reviewing a prenuptial agreement before its signing is sufficient to ensure its validity and enforceability, it is still generally recommended to review it with your spouse at frequent intervals – if you are able to do so while not actively engaged in divorce proceedings, it may smooth the process later when you actually are. Opinions and desires do change – but prenups may only be declared invalid if you are able to show fraud, lack of disclosure, or duress. It is also worth noting that if you fail to clarify details and questions with your spouse, you may wind up losing property you had thought was nonmarital, since inaction can show intent just as well as action. A recent case in the Florida Supreme Court held that two properties used by a married couple as family homes were part of the marital estate, even though the titles did not list the wife, since the assets were used in furtherance of the marriage. The court held that the husband had donative intent, because he could have clarified that he intended the homes to be his nonmarital property, and he did not. Prenuptial agreements can be complex to draft, and it can be just as complex to interpret them appropriately. If you have questions about marital and nonmarital assets, the dedicated Hollywood asset distribution attorneys at the Law Offices of Steven A. Mason, P.A. will do their best to assist. Contact the Fort Lauderdale and Hollywood Law Offices of Steven A. Mason, P.A. for legal advice at 954-963-5900 or leave a message online.